In business, the transactions between contractors, suppliers, and other parties are supposed to be accurately documented. 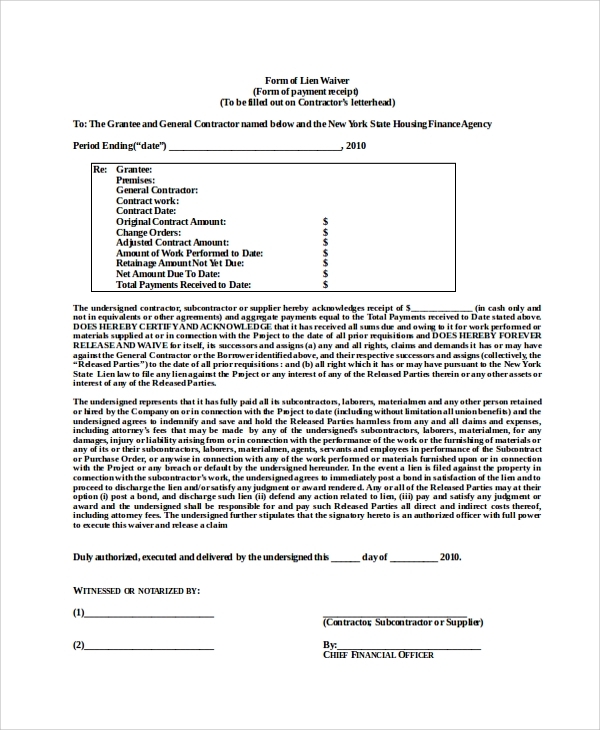 In this process, you need a Lien Waiver Form Samples. This form has customized designs with separate spaces to accommodate the names of the parties involved, the purpose of the transaction, their personal details and addresses and so on. This document provides authentication to the transaction. There are different forms including Medical Waiver Forms in use today. You can scroll down to find the commonly used lien waiver forms. 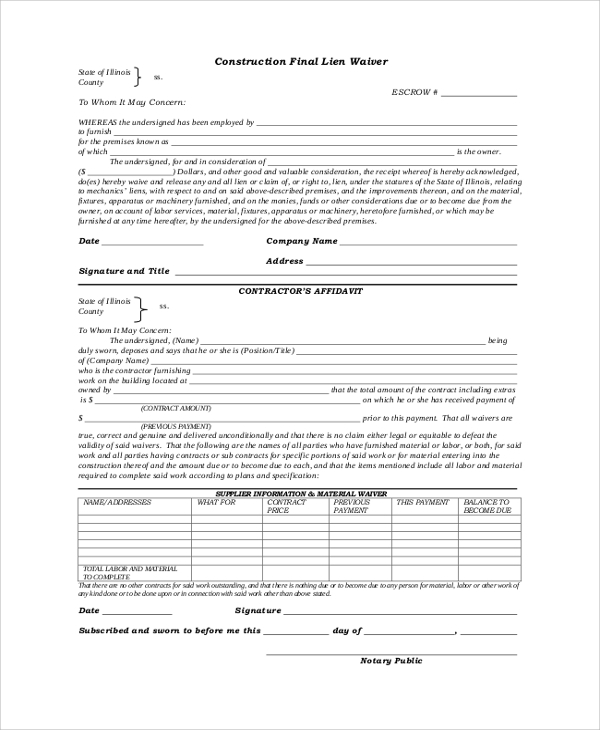 This is a simple yet formal waiver forms tailored to be used in industries related to mechanical works. The site of the work, the total sum of money and other details are clearly mentioned here. You may also see the Waiver of Liability Samples. The construction works include materials, apparatus, and other labor charges. These waivers mention all these heads of expenditure and declare that the payment has been made. The date and other details like company name are included here. These forms have all the specific details about the concerned work and parties involved. The details of payment are accompanied by the signature of the contractor. It also contains the exact state and location of the place. 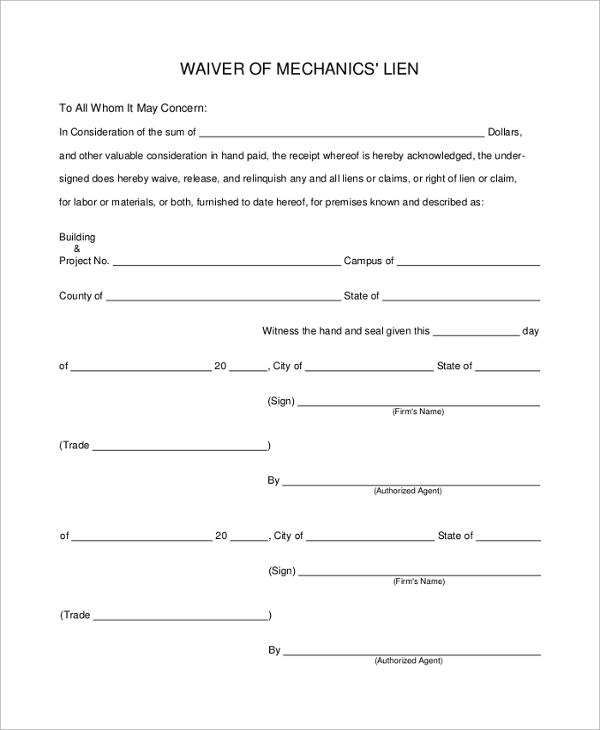 Why Is A Lien Waiver Form Required? 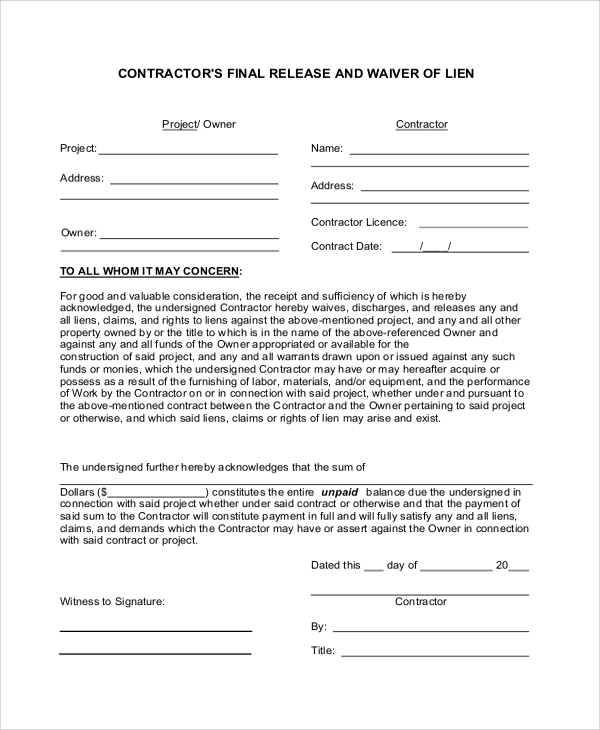 A lien waiver form is required to clarify that the transaction of money between a contractor and his client has been done. Suppliers and other agents too, use this document as a legal contract. 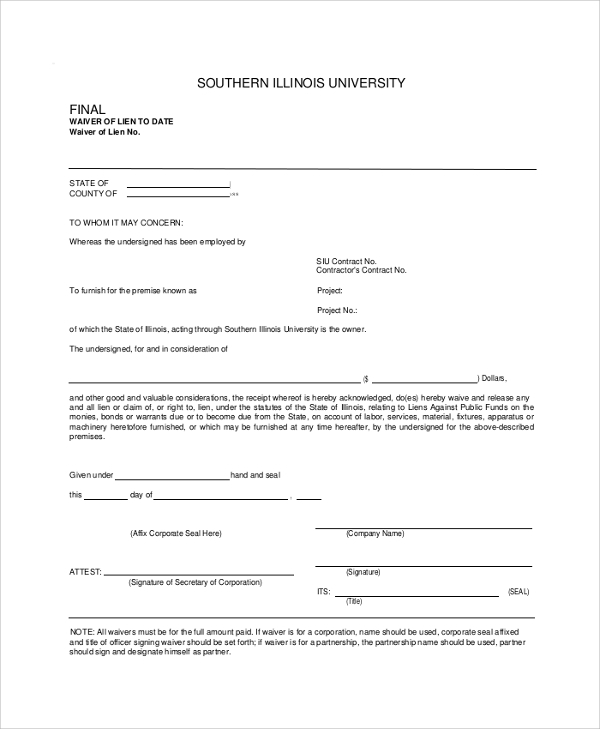 The primary use of this form is to authenticate the agreement that there is no outstanding payment to be made. You may also see the Lien Release Forms. Different clauses are included in the agreement. These are all listed up on the form and signed by the person in charge. It also confirms that both the parties are free from all sorts of obligations and no party owes anything to the other. 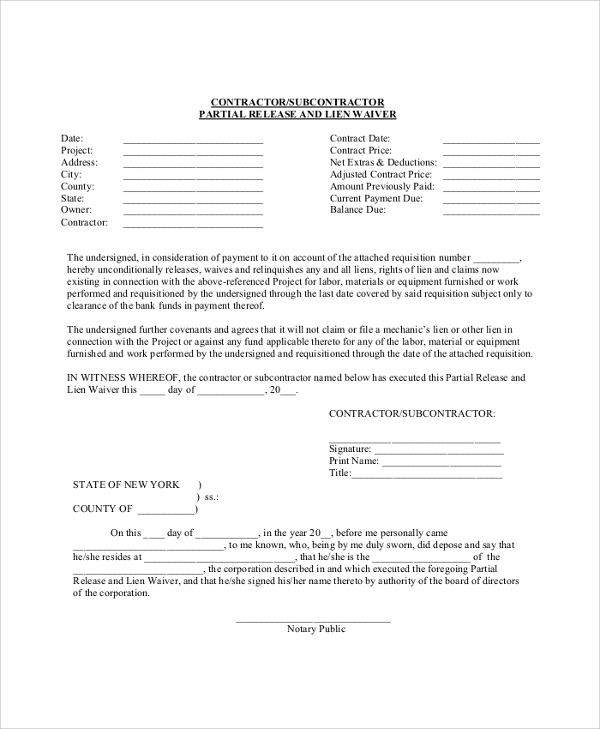 People use these lien waiver forms for final declarations of the details of payments made by the contractors. These too, contain all the relevant details of the work, including the costs, personal information, date and so on. 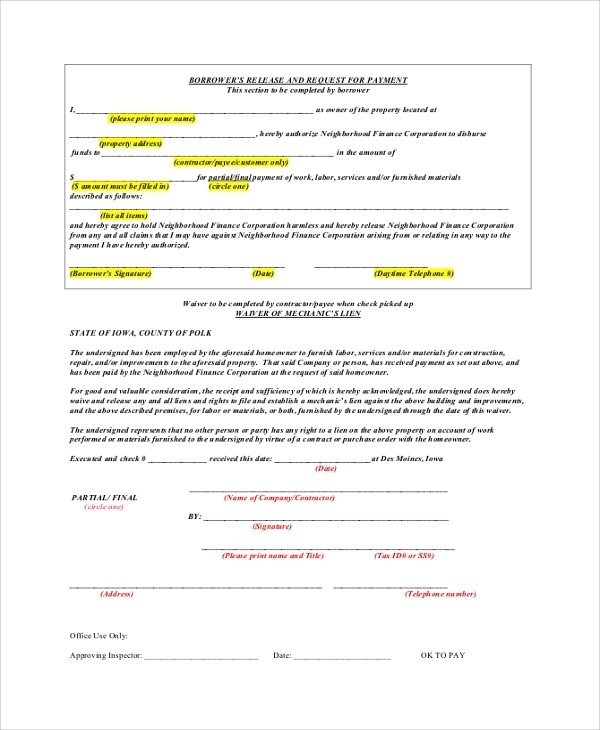 In these waiver forms, all the details of payment and vendors are made at the top. This is followed by the obligations and rules of the contract. In the end, the official signature validates the form. What Details Do These Forms Include? 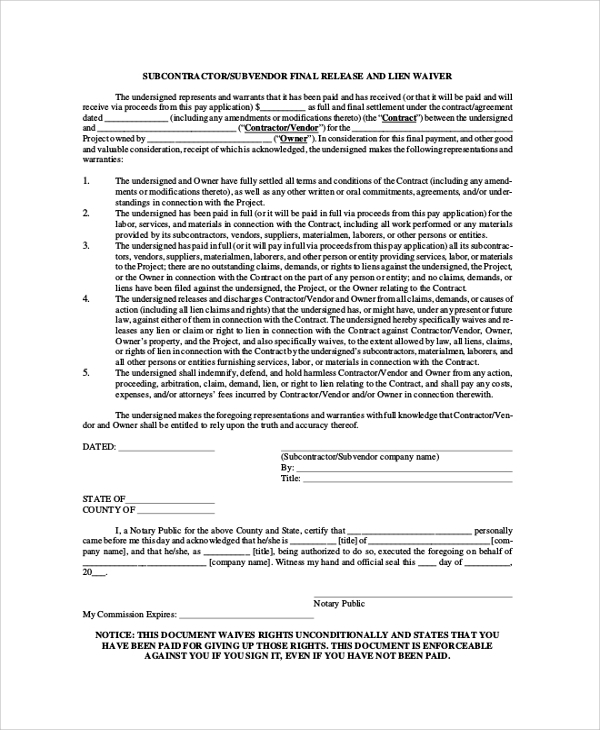 All the details of the contract are included in the lien waiver forms. These include the names of owner, contractor, company, address, project and so on. The date of starting and accomplishment of the project are also included here. In most of the forms, the amount of money is mentioned at the top. You may also see the Liability Waiver Samples. However, there are different variations where they are also included at the bottom. The signature of the contractor is mandatory for all the forms. The clauses of the contract are also included here. Sometimes a footnote is also needed in these forms. Altogether, it is a complete document for a transaction of money. There are different purposes for which these lien waiver forms are used. Accordingly, the format can be customized. Apart from these, you may also need the Liability Waiver Forms. All these formats are there on the website. You can check them out as and when you need and tailor them to perfection.